“It’s a new day, Sarah.” BBC America has just released a new preview for the upcoming final season of Orphan Black. 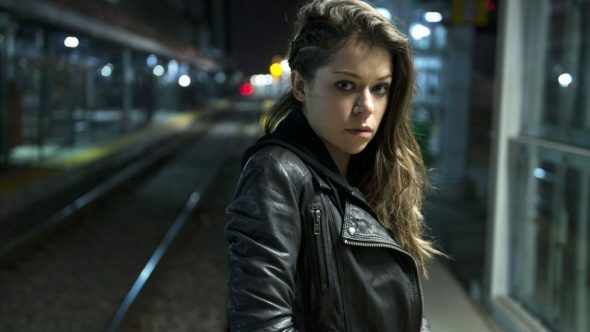 The sci-fi drama centers on Sarah Manning (Tatiana Maslany), a con-woman who discovers she is one of many clones that have been created by a scientific movement — and are at the center of an assassination plot by a secret religious group. The cast also includes Jordan Gavaris, Maria Doyle Kennedy, Kristian Bruun, Kevin Hanchard, Skyler Wexler, Ari Millen, and Josh Vokey. The fifth and final season of Orphan Black premieres on BBC America on June 10th at 10 p.m. ET/PT. BBC AMERICA released today the final Orphan Black trailer, revealing clues on the fate of the sestra-hood. Get a final look at what to expect this season on the network’s award-winning clone drama before the series returns Saturday, June 10th at 10/9c. The clones have been through it all together. From assassinations, detrimental illnesses, monitors and accidental murders to suburban drug fronts, kidnappings, male clones and biological warfare – there isn’t anything this lot hasn’t experienced. But through it all, they’ve remained united in their love and mission to keep each other safe at all costs. They’ve sacrificed their families, the loves of their lives, and any true sense of normalcy – all for the chance to liberate themselves from forces much bigger than any one of them. Now, they must all fight for the family they’ve chosen, for a new future and ultimately, for freedom. The cast and executive producers of Orphan Black will make an appearance in NYC at their sold-out Split Screen Festival screening and panel Tuesday, June 6th at 6:30p ET. What do you think? Are you a fan of Orphan Black? Are you excited for the final season?